When you travel to the 1000 Islands Region, you will find a wide assortment of accommodations, ranging form quaint inns and Bed & Breakfast facilities to luxurious resort hotels featuring spacious rooms and spectacular views. Among the assorted lodging facilities available to you during your visit to the Thousand Islands Region are also a wide variety of hotels and motels. 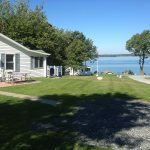 You will be pleased with the comfortable accommodations in the 1000 Islands, at rates that are often surprisingly low when compared with other parts of the country.